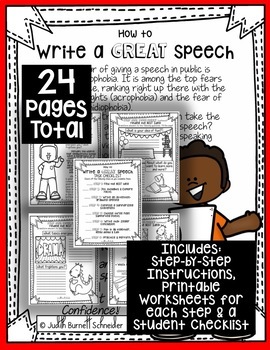 Writing and performing a speech can be one of the most challenging tasks for students. These eight simple steps take the fear out of speech writing and turn it into a simple and doable task. Interesting examples are provided, so your students can see how easy it can be to come up with an engaging topic. 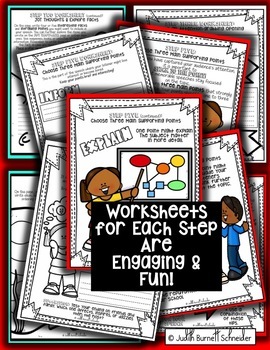 Then, step-by-step instructions keep the student moving through the task, providing simple guidelines and examples along the way. 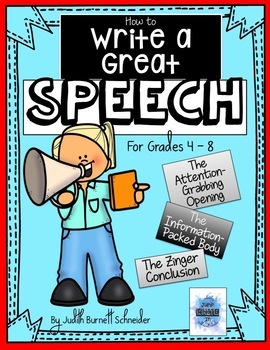 Helpful tips for practicing and delivering the speech are also offered. 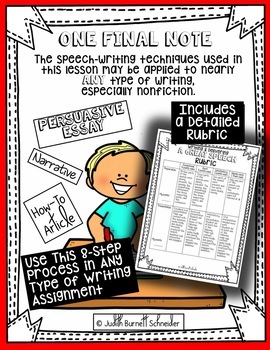 Printable instruction sheets and worksheets are provided for each step, as well as a student checklist,and a rubric. Some group activity is suggested.